In case you don’t realize it, Christmas and the holidays that surround it can be a busy season! In all the rush we may feel a little lost and wonder what happened to the “true meaning” of Christmas. Many have found ways to keep Christ in Christmas such as celebrating advent, attending a Christmas Eve service, reading the Christmas story with family or friends, and I’m sure many of you have your own traditions. Well, guess what. I want to help you out too. Because I believe this is of utmost importance to our joy: remembering what God has done for us and becoming a thankful person. We can always, anytime, no matter what is going on, thank and praise God. Take time during this season to sit down and read a psalm aloud to Him (yes read to Him) such as Psalm 30, Psalm 27, or Psalm 100. Spend time just being with your Lord. I know this can also be a sorrowful time for many. While it is a popular misconception that suicide rates go up around Christmastime, a significant number of people do face the “holiday blues.” So as we get our preparations underway, let’s be aware that the people around us may be lonely or have horrible memories of Christmases past or may have experienced a tragedy in recent days. Perhaps we can reach out to someone who seems a little down and of course, we can do the most powerful thing possible and pray for them. I am praying that you, my reader, will experience the joy this season can bring, along with the excitement and the wonder of it. Because no matter what we have been through in the past, what we are facing right now, or how lonely we may feel, we can still experience joy—a deep-rooted joy that can remain with us all year. I’m sure some of you have already seen this video (link below), but in case you haven’t, I hope you will watch and remember all that Christ has done for you. He loves you so very much. The death of a loved one can be traumatic to say the least. Aside from the sadness, the hole left in our lives, or any number of emotions, grief can sneak up on us and strike when we least expect it. A movie, a casual comment, hearing a phrase the loved one used, or even a commercial can trigger tears or the wrenching of our hearts. Today I want to take another peak at the lives of Mary and Martha, the sisters of Lazurus. The three siblings were apparently very close to Jesus, and we have the opportunity to observe the sisters’ reactions and the reaction of our Lord to the loss of a loved one. So let’s spend some more time with these two fascinating women and see how they interact with Jesus at a tragic juncture in their lives. It’s kind of a long chapter, but I encourage you to read John 11:1-43 for yourselves. In John 11:17, Jesus arrives when Lazurus has been in the tomb for four days. In verse 20 Martha hears He is coming and goes out to meet Him while Mary stays at home. Wait. What? Is that right? Yep. That’s Martha all right, heading down the road to meet with Jesus while Mary stays at home with the guests who had come from Jerusalem. Let that sink in for a minute. Martha who previously had been the one hurrying about, anxiously serving and taking care of preparations leaves a house full of mourners and heads out to meet Jesus with no desire that I can see, to serve Him. She simply wants to get to Him. Perhaps she is hoping to receive comfort. Or perhaps she wants to confront Him. All we know is that Martha wants to be with her Lord. 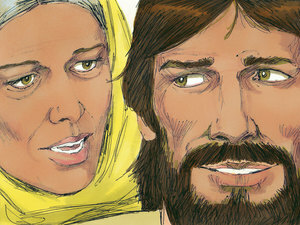 Jesus then tells Martha that her brother will rise again. She understands this—she knows he will rise at the last day. But Jesus has something more to share. “I am the resurrection and the life,” He tells her. “He who believes in me will live even though he dies, and whoever lives and believes in me will never die.” I imagine Him stating these words gently with an extra dose of the love that He has for this woman. When she returns, who does she go to? The Bible says she pulls Mary aside and tells her sister that the master is asking for her. I’m so glad we get to see this side of Martha as she delivers the message that Jesus wishes her to come to Him. That is so awesome. Picture Martha’s kindness to Mary as she pulls her aside so they can speak in private. I love it. And Jesus requests her presence. So now it is Mary’s turn to go to Jesus. And she leaves so quickly that those who had come to comfort notice and follow her. in a display of devotion. So now her emotions spill forth again in much the same way but this time with grief. And she says the same words as her sister. “Lord, if you had been here, my brother would not have died.” According to the Scripture, she doesn’t add Martha’s statement that God would do whatever He asked, yet Jesus understands her aching spirit. He is moved by her weeping and the weeping of those who had come with her. Maybe this is the reason “Jesus wept” for as soon as He asks where they have laid Lazurus and they tell Him “come and see,” He weeps. The ISV states that Jesus burst into tears. The Aramaic Bible in Plain English says “And the tears of Yeshua were coming.” I don’t know about you, but I want to weep when I read those words. Theologians have come up with a number of reasons for Jesus’ tears. All we really know is that Jesus is moved with compassion for Mary and for all the Jews who had come with her. As you probably know, the stone is moved and Jesus calls Lazurus from the grave. Many come to believe in Him because of this miracle much to the chagrin of the Pharisees. It is interesting that the Bible says nothing about Martha and Mary’s reaction to having their brother back. And I wonder–do they dance with joy as they welcome him into their embrace? Do perhaps both of them fall at Jesus feet and cry tears of joy? As Jesus wept with them, does he now laugh with them? Or maybe they stand in stunned silence. But God was glorified as Jesus said He would be (verse 4), and both sisters find comfort in Christ.